Similar to the built-in 3D globe, you can export itineraries as .kml files for Google Earth. 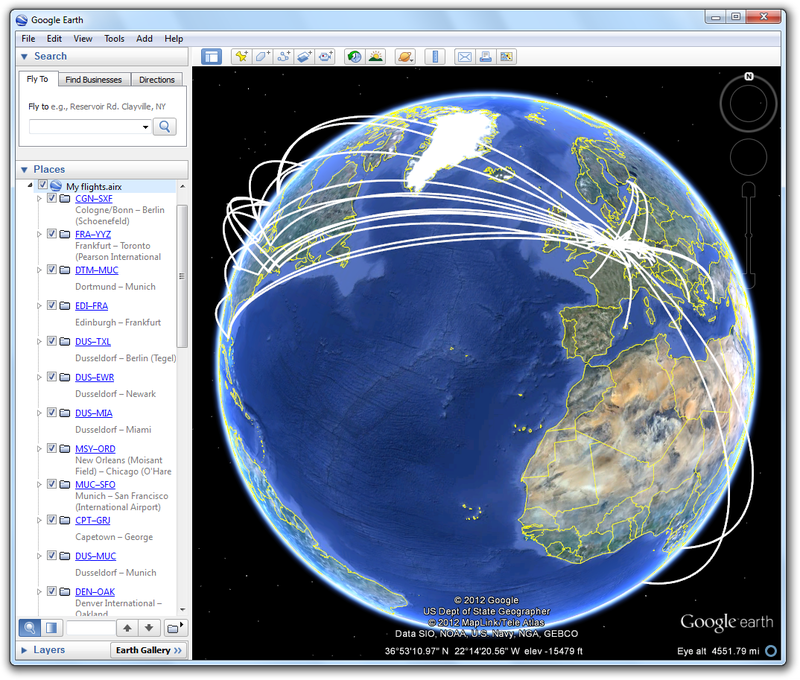 It's Google Earth's task to visualize the created files, so the settings in Flightmap are rather limited. The sidebar command opens your itinerary in Google Earth, which is only available if you have Google Earth installed on your computer. If you have certain flights selected, only those are used. Regardless of Google Earth, you can always export your itinerary to a .kml file using the “Save as” command in the file menu. At the top of the settings dialog you'll find the usual checkbox to merge nearby airports into a single IATA metropolitan code (e.g. EWR, JFK and LGA become NYC). Below that are three settings to control the style of the exported files. 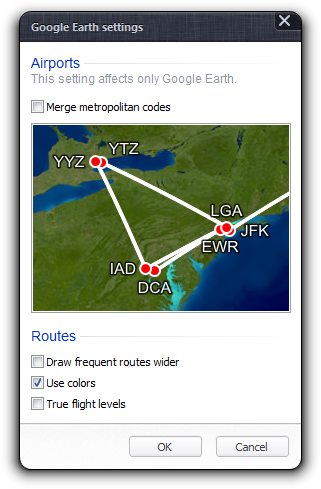 The width of a route can be selected in regard to frequency, and you can either use the individual colors assigned to flights, or force white as default color for all flight paths. “True flight levels” allows you to create Great Circle paths whose height is in scale with the globe itself, but which are less visually pleasing. All menu options are stored in the Windows registry on a per-user basis.